HomeWhy not drive traffic to your blog with an influencer leaderboard? Why not drive traffic to your blog with an influencer leaderboard? Would you pay $50 a month if you knew it would drive the top 50 people in your specific sector, and their followers, to read and share about your blog each month? I thought you might. Getting the attention of the top influencers in your area is a great way to promote you and your blog. Take the annual Top 50 influencers in Social Media list put together by Haydn Shaughnessy at Forbes. Love it or hate it, it drives conversation and engagement. This translates into numbers any blog editor can relate to – Haydn’s post has been shared 10,000 times and viewed over 80,000 times. Other bloggers can join in and fuel the conversation, as was shown in this follow up post by Mark Schaefer “25 social media influencers Forbes ignored, and why”. Getting influencers engaged in your blog is definitely worth doing. The Top 10 on Haydn’s list had a whopping 2.6 million followers between them. In the past, creating these lists has been a subjective and time consuming effort, but new tools are making this easy. PeerIndex, a Klout competitor who provides a social influence score for everyone on the web, recently launched a new ‘influence graph’ feature: this allows you to see who is influential within a specific community. Peer Index has teamed up with us at Leaderboarded, a scoreboard for digital competitions, to provide a valuable Top Influencer Leaderboard that you can create for your own specific interest. Share the news that a Top Influencer leaderboard has been created and watch your traffic build in both quality and quantity. Once you’ve created your leaderboard and shared it, the next step is to get people coming back. That means keeping people in suspense each month and writing a short accompanying blog post about the latest changes – who’s hot and who’s not. 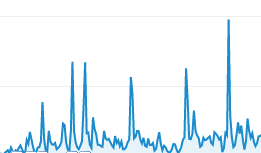 Then when you release the leaderboard each month you’ll get another spike of traffic. You’ll be amazed at the spike of interest on your blog. One recent client confided in me “we were blown away”. The leaderboard speaks to human nature, everyone who’s on the list will want to see it and see where they stand (ego bait) while others who are not on the list will want to get on it. I did exactly this with my Gamification Gurus monthly leaderboard of the who were the movers and shakers in the nascent Gamification industry. As you can see from the monthly spikes of traffic (shown below) – the gurus leaderboard is a very successful element of my blog.